I have a great relationship with my librarians, the old one and the new one, so I always get 'presents' when I rock up to the library. Often books I would never have found. 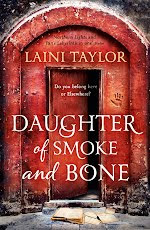 The other week I got "Daughter of Smoke and Bone". It blew my mind. It is the most incredible story. Something you just wonder how anyone thought up. And the writing is interesting, colourful and paints vivid pictures. I devoured it... and gave it to my husband, who also devoured it (and he's not usually a fast reader). 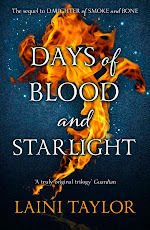 Then I went and bought it for my Dad to read, and while I was there, I bought book 2, which is also amazing "Days of Blood and Starlight". It's pure fantasy - angels, demons, and shapeshifters - but different to anything I've ever read. I'm not going to say any more because I think you need to unravel the story yourself. Totally loved them and now waiting on Book 3.